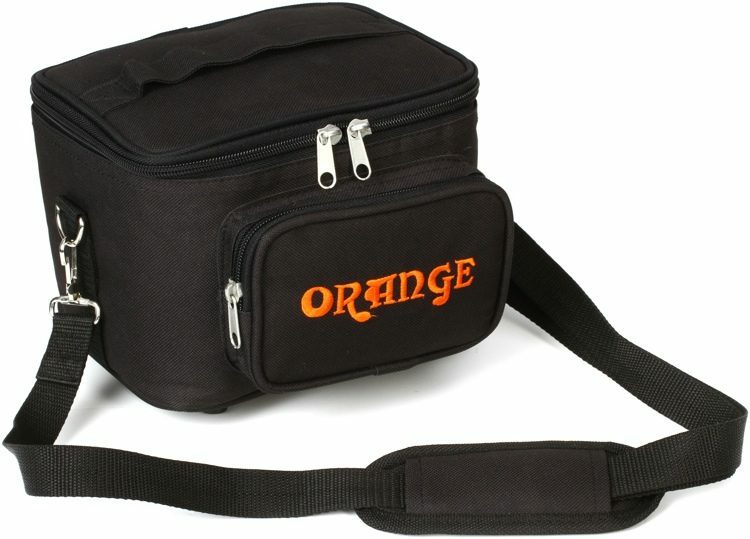 Orange really revolutionized the amplifier market with its original Orange Tiny Terror series of “lunchbox” style guitar amps. Typically about the size of a lunchbox, simple controls, lower power, “lunchbox” amps are great bang for the buck as far as portability, tone, and power. Every manufacturer has a “lunchbox” amp now. So Orange took it one step further and created what I will dub a “snackbox” size amp with the Micro Terror series. First with a regular Micro Terror, and then the darling of this gear review, the Micro Dark Terror. So small it could fit in the pockets of those JNCO jeans from the 90s, so light it could be benchpressed by a newborn, so loud it could wake the dead. Ok, those are exaggerations, but you get the idea. I originally acquired the original Micro Terror (the white one) when it first came out. I thought it sounded great, albeit a bit weak in the low end. It wouldn’t get your pants moving, if you know what I mean. Plus the lack of an effects loop or built in reverb just left me wanting more. When the Micro Dark came out, I watched every demo video I could find of it, and it just seemed to have a more full sound. I immediately listed my Micro Terror for sale and found a great deal on a used Micro Dark. It’s a simple amp. It’s one channel, dial in the amount of volume you need, the amount of gain you desire, then start with the Shape knob around noon, and you’ll probably have a great sound in 2 seconds. The Shape knob is a mid-shift knob that increases the mids as you turn counter clockwise, and cuts the mids while simultaneously adding a bit of high end as you turn it clockwise. This is one of those amps where the EQ, or “Shape,” is optimal around noon on the dial, depending on your guitar and speaker. I find myself only having to make slight tweaks to the Shape knob if I have an overly bright guitar/speaker or an overly dark guitar/speaker. The Gain characteristic is definitely more of a modern sound. Overall, Orange markets its Dark amps towards a heavier style of music, but that doesn’t mean they’re only for metal players. When comparing this to the original Micro Terror, the mid range is actually comparable, but this Micro Dark just adds some low end thump to it that results a very full sound. There’s still plenty of midrange bite in this amp to cut through a mix. The Gain can go from pretty much clean (with single coil pickups) to pretty much as much distortion as you could ever need. The gain is that pure Orange crunch that we’ve all come to expect and love. The real magic of this amp is how much volume it puts out for such a tiny package. I’m not smart enough to know the technical reasons why Class-D is so efficient, but I just know from playing this little beast that it can hang with a loud band. When I say loud, I wouldn’t fill an entire dance hall without being mic’d, but it can be heard with a decently loud drummer. Now, while this amp does sound awesome, it’s not going to sound like an all tube amp when it’s cranked. The preamp tube does add a nice bit of warmth and gives you some nice preamp gain, but a Class-D amp isn’t going to provide the breakup and sag of a tube-based power amp. I’m not necessarily holding that against this amp. It provides great sounds, just not a cranked power amp sound. It will, however, still sound great at whisper quiet volumes, unlike most fully tube amps. When I see people bashing this amp when comparing it to the all-tube Terror series, it really is an apples and oranges comparison. For the price and size, this amp is one of the best values out there on the market. The headphone out, I’ll just say it’s useable. I wouldn’t use it for recording, but if you have to practice through headphones, I think it’s not the worst sound in the world. It’s Always Good To Have A Backup! The real reason I love this amp: it makes the ultimate backup amp. With it’s little carrying case (which is about the size of a small camera bag), it’s very easy to grab and bring with you to the gig. I bring my Micro Dark Terror to every gig I play. I have a bigger duffle bag that I use to carry my cables, picks, extra strings, etc., and my Micro Dark just lives in the duffle bag. If something happens to my amp, I can just plug this in, switch the speaker cable to the it, and keep rocking. I’ve been lucky that I haven’t had to do it with my own amp, but the other guitarist in my band has had a finnicky amp for a while. I’ve had to bust this little beast out for him to use mid gig. To be honest, I doubt most of the crowd noticed, and to me, it almost sounded better than the expensive amp he was using. Orange really has changed the way most of us look at amplification. Micro can be mighty. This is a great amp for everything from bedroom jamming to gigging. Find your own deal on an Orange Micro Dark Terror on eBay HERE!